Arlee High School students Naomi Plant, Abby Yocum, PJ Haynes and Zach Felsman visit schools to talk about life on the reservation. ARLEE — People living on the reservation sometimes hear strange things about what life is like on land designated as tribal ground. Arlee High School students say they’ve heard it all. “I’ve heard people say they think we live in teepees and lack technology,” Zach Felsman, 18, said. Zach sometimes hears “go back to the rez” at football games. Many of the labels have to do with appearance. “I’ve heard we are tall and skinny and shoot arrows all the time,” said Naomi Plant, 15. PJ Haynes, 17, says there is an underlying problem with these labels. 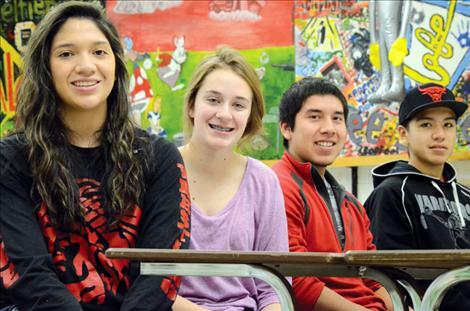 Arlee teacher Anna Baldwin decided that those stereotypes need to change. She put up a flyer a few years ago asking if students wanted to start a group and travel to different schools to talk about what it’s really like to live on the reservation. Baldwin is a non-Indian teacher. She has taught in Arlee for 11 years and picked up numerous teaching awards. She has also taught in Pablo. Her doctoral research was in professional development and Indian Education for All. Twenty-six students signed up for the group. Zach was one of the first. The group has traveled to six different schools in the past few years to talk to 225 students in small groups. Abby Yocum, 15, is one of the non-Indian students in the group. She joined the group to help show the cultural diversity that exists on the reservation. Abby said she was surprised by how many people assumed a person living on the reservation was Indian. Baldwin said the multicultural diversity of the group is important. “The kids represent the diversity we have on the reservation,” she said. The group recently traveled to a school in Kalispell. Baldwin emphatically explained to the Kalispell students that they were sharing what they have heard about reservation life. Many of the students opened up in the small groups and wrote the things they’d heard on a large sheet of poster paper. Some of the labels about Indians included: savages, drunks, greedy, spiritually inclined, smoke tobacco, ride horses and gamble a lot. Baldwin said some of the comments the students hear are not racist. Baldwin structures school visits towards the age group of the students they are visiting. During the Kalispell trip, the students led a question and answer session after they identified the labels. Zach said he often explains that people on the reservation do have electricity.